Here are two books that collectors of 12" vintage figures will love - the Encyclopedia of Marx Action Figures by Tom Heaton, and the Collectible G.I. Joe by Derryl DePriest. Both these books have alot to offer the serious and novice collector. 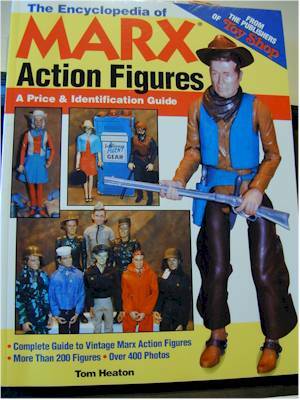 This is THE book on Marx action figures, bar none. 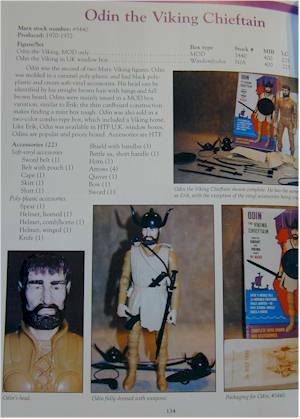 It has terrific photos, showing all the standard figures and many of the variations on the Best of the West figures, the Knights and Vikings, the Gabriel Lone Ranger line, the Ready Gang series, the Safari Adventure series and even the Archies. Each figure is accompanied by manufacture dates, a listing of accessories (crucial to the Marx collector! ), and terrific descriptive text, explaining variations and oddities. There are also prices included, but I'm not much of a fan of price guides. I feel the book would have been better off without the addition of the ball park pricing, but some people find great value in this information. As I said, the photos are very useful, but I think that shooting with better light would have reduced the amount of shadows in some of the pictures. But this is a minor complaint, and you'll see some items pictured in this book that are extremely rare. If you love the Marx line like I do, then I can't recommend this book enough. Mr. Heaton has done an excellent job providing useful, informative information along with well done photos. The first section of the book provides a great over view of the history of Marx and the figures, providing the collector with the background information that is so often missing in the average price guide. Obviously, Mr. Heaton loves the toys as much as the rest of us, and it's refreshing to see. If I have one complaint, it's that the book was done in soft cover - I suspect that repeated use will cause problems with the spine over time. Where the Heaton book is perfect for Marx collectors, the DePriest book is perfect for the collector of vintage Joe. Following the line from year to year, and including exceptional pictures of the figures and vehicles in action, Mr. DePriest provides an entertaining yet informative read. The real beauty of this book is in the photos. While the text does a nice job of providing information, it's the pictures that bring out the real beauty of Joe. 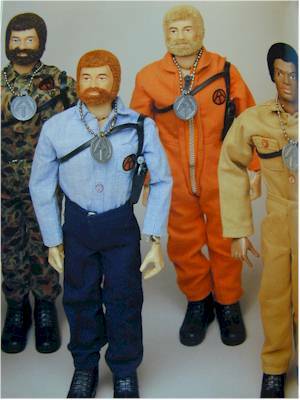 With great care, the figures are posed within appropriate terrain, and the vehicles are shown off in all their glory. I'm very impressed with the quality of the figures used in the photos - and there are some awfully rare items! This book also features a price guide, but it is included in the back. While I prefer this, since it makes it less obtrusive, this one is a bit hard to follow. Page numbers for pictured figures would have been helpful. If you have fond memories of your childhood days, playing with your favorite Joe, then I highly recommend picking up this book. 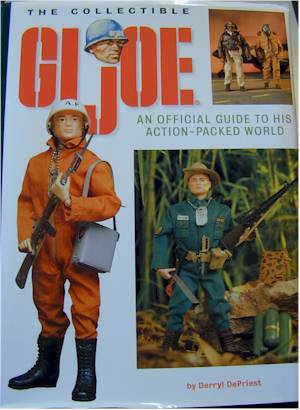 I warn you though - this book could turn you into a Joe collector!